What would a great vacation be without great food? We found that the city of La Terrenas has no shortage of great places to eat. 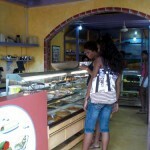 Most of the restaurants don’t open for breakfast but one little pastry shop, Boulangerie Francaise in the middle of La Terrenas opens at about 7:00 in the morning. 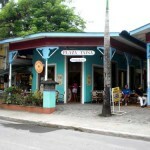 It’s the corner store of the Plaza Taine which is within easy walking distance of most of the Las Terrenas Hotels. As you walk in the first thing you notice is the aroma of fresh warm bread. There is an array of fresh bread of several different types, Danishes, and donuts to choose from. 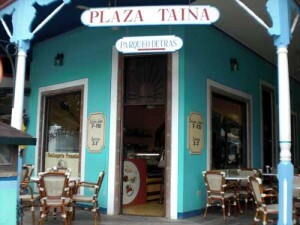 They also have a number of different sandwiches on fresh bread and then my favorite dish there. The quiche! Normally I’m not a big quiche fan, but this was great, enough so that we chose to come back the next morning to have it again. They also serve Pizza. At times they have a pan and you pay for a serving, at other times they have smaller personal size pizzas available. 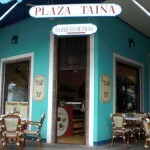 They also have Coffee con Creama (coffee with cream). The coffee is topped with a thick layer of foamed cream with a sprinkling of cinnamon on the top. You choose your items and then sit out on head out to the sitting area where they will bring your items out to you. 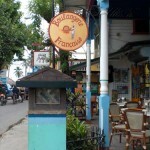 In all we found the Boulangerie Francaise a pleasant little place to sit an enjoy breakfast while visiting La Terrenas.